Webb Simpson had his first success on the US PGA Tour at the Wyndham Championship in 2011 and quickly followed up in the FedEx Cup playoff event, The Deutsche Bank Championship. Those victories took him to second place on the money list and he confirmed his arrival among the world’s elite golfers when claiming his first major, the 2012 U.S. Open. Simpson played collegiate golf at Wake Forest University on an Arnold Palmer Scholarship. He was a three-time All-American and the ACC Player of the Year in 2008. He was also part of the successful US Walker Cup and Palmer Cup teams in 2007. He turned professional in June 2008, finishing runner-up twice on the Nationwide Tour, including being beaten in a playoff for the Chattanooga Classic. 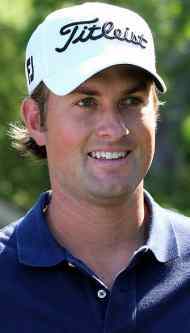 He earned his PGA Tour card for 2009 through the qualifying school and began his rookie year with two top-ten finishes. His form dipped markedly after that promising start, missing nine out of thirteen subsequent cuts. He turned his fortunes around at the FedEx Cup playoffs, finishing eighth at The Barclays to ensure further progression to the second and third playoff events. He ended the season with four top-10 finishes. However, Simpson struggled again in 2010, managing only two top-ten finishes in the entire season. Those came towards the end of the year but he dropped to 94th in the money list. He returned to something like his best at the start of 2011 with three top-25 finishes early on and then came within a whisker of his first PGA Title at the Transitions Championship. A bogey at the 72nd hole cost him the chance of a playoff with Gary Woodland. The frustration continued when he lost out to Bubba Watson in a playoff at the Zurich Classic of New Orleans. He was tied with Watson at 15-under-par after the full 72 holes but only after he had incurred a one-stroke penalty at the 15th when his ball moved fractionally while he was addressing it. The first playoff was shared with birdies but Watson birdied the next to win the tournament. Simpson finished in a tie for 14th at the US Open, his first major championship, and then finished 16th at the British Open. He finally gained his first PGA Title at the Wyndham Championship in Greensboro, North Carolina in August 2011. Simpson won by three strokes from George McNeill after shooting 67 in his final round. In September, Simpson won his second tournament at the second FedEx Cup playoff event, the Deutsche Bank Championship. A birdie from Simpson on the last green followed by a bogey from Chez Reavie brought the scores level and Simpson prevailed in a sudden death playoff. That victory moved Simpson to first place in the FedEx Cup standings for the first time in his career. He eventually had to settle for second place, 15 points behind Bill Haas. He almost added a third tournament for the year when losing to Ben Crane in a playoff for the McGladrey Classic in October. When Luke Donald won the final event of the season, he dislodged Simpson from the top of the PGA Tour money list. Simpson made a promising start to the 2012 season when finishing tied for third at the Hyundai Tournament of Champions. Two more top-ten finishes were followed by a fourth place at the Wells Fargo Championship. Simpson enjoyed by far the biggest win of his career to date when he won the U.S. Open at the Olympic Club in San Francisco. He shot a two-under par 68 in the final round to defeat Graeme McDowell and Michael Thompson by one stroke. The win elevated Simpson to a career-best fifth in the Official World Rankings. Simpson withdrew from the British Open because his wife was expecting their second child and he did not return to competitive golf until the PGA Championship, missing the cut by one stroke. He qualified automatically for a first appearance in the American Ryder Cup team, winning 2 of his three matches when paired with Bubba Watson but being defeated 2up by Ian Poulter.